Saint Adalbert was a bishop of Prague, martyred in his efforts, to convert the Baltic Prussians. He was made the patron saint of Bohemia, Poland, Hungary, and PrussiaHe was born in a Czech noble family of Prince Slavník in Libice. His father was a rich and independent ruler of the Zličan princedom that rivaled Prague. He had five full brothers: Soběbor , Spytimir, Pobraslav, Porej, Caslav and a half-brother Radim. Radim chose a clerical career as did Adalbert, and the name Gaudentius. Adalbert was well educated, having studied for about ten years in Magdeburg under Saint Adalbert of Magdeburg. Upon the death of his mentor, he took on the name Adalbert. Adalbert soon became well-known all over Europe. In 989 He went to Rome and lived as a hermit in St. Alexis Benedictine monastery. Four years later, in 993, Pope John XV sent him back to Bohemia. Adalbert became the Bishop. He founded a monastery in Břevnov, near Prague, In 995 Slavniks' former rivalry with the Přemyslids resulted in the storming of Libice and a cruel murder of four or five of Adalbert's brothers. All this was done by Boleslav II of Bohemia, and the executioners were his confederates from a powerful clan of Vršovci. The Zličan princedom became part of the Přemyslids' estate. Adalbert went to Hungary and baptized Géza of Hungary and his son Stephen in Esztergom. He then went to Poland where he was cordially welcomed by Bolesław I the Brave. After the short visit Adalbert went to Prussia with a Christian mission. Christian missionaries chopped down sacred oak trees, because the trees were worshipped and the spirits who were believed to inhabit the trees were feared for their powers, this was done to show the non-Christians that no supernatural powers protected the trees from the Christians. 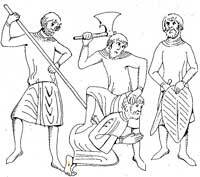 They did not heed warnings to stay away from the sacred oak groves; Adalbert was executed for sacrilege, which his co-religionists interpreted as martyrdom, in April 997 on the Baltic Sea coast east of Truso. His body was bought back for its weight in gold by Boleslaus the Brave. 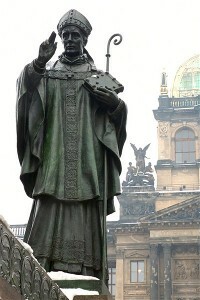 Later Adalbert was canonized as Saint Adalbert of Prague. His life has been written about in Vita Sancti Adalberti Pragensis by various writers..